Joe Gorga joined the ladies on stage during Part 2 of the reunion, but the rest of the husbands, and Frank Catania, show up for Part 3. Without Marty Caffrey is there any husband drama to discuss at this point? No, not really, but they’re all there anyway. And so is Danielle Staub! Of course, Danielle will continue her feud with former friend Margaret Josephs. Teresa and Melissa Gorga will continue arguing, forever. Also, the guys share what their taglines would be if they were full-time cast members on the show. Change the channel to Bravo tonight at 8 PM to watch the Real Housewives of New Jersey reunion. Yes, that’s an hour earlier than normal thanks to the Real Housewives of New York Season 11 premiere. Join us in the comments on this post to share your thoughts on the episode. Tweet us your thoughts and check us out on Instagram. And, of course, come back here tomorrow for our Real Housewives of New Jersey recap. 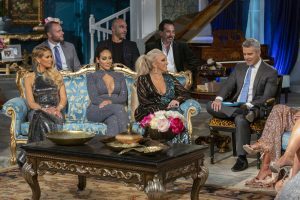 RELATED: Real Housewives Of New Jersey Reunion Part 2 Recap: Sister, Sister! TELL US- WHAT DO YOU THINK ABOUT THE MEN JOINING THE REUNION FOR PART 3? DO YOU THINK MARTY CAFFREY SHOULD BE AT THE REUNION? DO YOU WANT ALL OF THE CURRENT CAST MEMBERS TO RETURN FOR THE NEXT SEASON?